(I originally posted this at The American Catholic, and I thought the Star Wars mavens of Almost Chosen People might enjoy it. Something for the weekend: Africa by Toto. I apologize to all of you who will have this tune stuck in your brain for the next day or so. Feel free to post other renditions and variants in the comboxes. on January 19, 2019 at 5:30 am Comments Off on Enough Africa! Sad news that actress Nichelle Nichols, at age 85, has been diagnosed with dementia. Prayers for her and her family. Something for the weekend. Theme songs from Lost in Space. As a kid I loved the show, even though even at the age of eight I realized the show was science fantasy rather than science fiction. The 1998 Lost in Space movie left me cold as it was too dark for my tastes and did not fit the lighter tone of most of the episodes of what was often an especially silly show. A new Netflix take on the show debuted yesterday. The episodes I have thus far watched aren’t bad. Time to refresh my Chief Geek of the blog creds. The Axanar film project has produced huge fan interest, and well it should. The Prelude to Axanar video below is the best Trek I have ever seen. Jonathan Lane has written, and Mark McCrary has illustrated, the first illustrated fan short story set in the Axanar universe. With their kind permission I am posting it here. Give your comments in the comboxes. Go here to view the Fan Film Factor Blog. DARIA: Crash and burn, Matt! MATT: Which one did I miss? DARIA: Hey, why is it called the Hercules and not Heracles? DARIA: All the other human Ares-class ships are named after GREEK gods. Hercules was the ROMAN name for Heracles, which was the original Greek name. MATT: Hey, Daria, when did you get transferred from biochemistry to ship’s cultural historian? DARIA: Pulse you, Decker! When I signed up for Starfleet, I figured I was gonna EXPLORE alien societies…not shoot at them. MATT: Yeah, I think that’s true for most of us. THALEK: Not me. I wanted to fight! RON: Well, you’re just an idiot is what you are. MATT: Hey, I thought Hercules–excuse me, HERACLES–wasn’t even a full god. Wasn’t he just a half-god? RON: Don’t tell Captain Travis that. He’ll knock you right into San Francisco Bay…from here! DARIA: So how many Ares-class cruisers do we have in service now? DARIA: Huh? Thalek, how is it that an Andorian knows the name of an ancient Earth god? THALEK: I don’t. But the USS Janus is getting an Andorian crew, and I’m being transferred from the Poseidon as soon as the new vessel is ready. 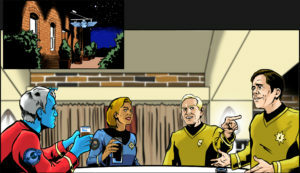 RON: Speaking of Andorians, Thalek, why is it that you hang out with us humans here at the bar? MATT: What he means is that most of the crews stick with their own species. Look around. The Tellarites drink with other Tellarites. The Andorians drink with Andorians. The Vulcans…well, I don’t think they even drink, but they certainly don’t socialize with us. THALEK: One could say that you humans don’t exactly socialize outside of your own species either. THALEK: Hah! As you humans say, I’m just pulling your hair. THALEK: Why would someone pull a leg? THALEK: It’s true that we are all still a little leery of the other races—Vulcans, Humans, Andorians, Tellarites, Nausicans, Deltans. The Federation covers a vast span of the galaxy, and our races don’t get many opportunities to interact with each other. Without warp-six capable starships, it can take weeks or even months just to get from one star system to the other. DARIA: But now we’re all here on Earth together, fighting a common enemy. You’d think we’d make more of an effort to get to know each other. RON: I don’t! That’s my choice. RON: Pulse you! I know what I said! RON: I’m just saying what we’re all thinking! Tellarites—they’re obnoxious! They think they’re hot plasma, but they’re just a race full of angry, pig-nosed bloodworms! Deltans…they’re supposed to be so “sexually mature” that we aren’t even supposed to talk to them! What in blazes is up with THAT??? DARIA: Ron, keep your voice down, you’re making a scene. MATT: Seriously? You’ve got a problem with Denobulans? RON: Why shouldn’t I??? They think they’re so blasted superior to us. For a hundred years, they held back technology from Earth—even though we were supposed to be allies—said we weren’t ready for it. We had to claw our way to a Warp 5 engine that they’d already had for centuries. THALEK: That doesn’t surprise me. The Vulcans used to be quite protective of their technology. MATT: Hey, did you know my great-great grandfather worked with Henry Archer on the Warp 5 project? Or was it three greats? DARIA: My great-grandfather served under Henry Archer’s son on the Enterprise during the Romulan War. He was their helmsman. I think Captain Archer’s first officer was a Vulcan. THALEK: I don’t beleive so. I seem to recall that she helped reveal the existence of a Vulcan listening post that was covertly monitoring my people. I doubt that a Vulcan spy would assist in a mission that would so jeopardize a clandestine operation like that. RON: Doesn’t it bother you that they were spying on your planet in the first place??? THALEK: That was nearly a century ago. The Vulcans have changed. DARIA: Ron, please quiet down. You’re embarrassing all of us. DARIA: And the Vulcans gave us shields and life support systems. RON: But they held back the weapons!!! Why? YOU HEAR ME, YOU POINTY-EARED HOBGOBLINS? RON: DON’T IGNORE ME, YOU GREEN-BLOODED COWARDS!!! Why didn’t you give us weapons? We know you have them! And they’re probably much more advanced than ours. Or maybe you could have helped us, worked with us, to improve the weapons that we ALL have. DO YOU WANT THOSE BLOODTHIRSTY KLINGONS TO WIN THIS WAR??? RON: LOOK AT ME, BLAST IT!!! You Vulcans–you’re not even fighting! You’re just PRETENDING to fight! MATT: I’m going to find someone from security. RON: You could have saved the crew of the Tecumseh! They were being decimated by the Klingons!! The Nike was the first ship to arrive at Altair VI. But instead of engaging the Klingons, you held back. WHY??? My sister was on that ship, and you sat back and didn’t fire a shot! You cowards hid behind a stupid moon!!! WHY???? Why didn’t you engage sooner? WHY DID YOU WAIT??? GARTH: Because I ordered them to. DARIA: (whispering) Holy…is that who I think it is? GARTH: At ease, everyone. You, too, Lieutenant…. Lieutenant? RON: Tracey, sir. I’m a weapons officer on board the USS Zeus. GARTH: Lieutenant Tracey, I’m sorry about your sister. I truly am. We lost 184 valiant men and women in that battle…but it could have been more. I gave the Vulcans on the Nike the order to wait behind that moon until the rest of their squadron could arrive. RON: But why, sir? The Tecumseh was crippled, defenseless. They had no chance against the Klingons. GARTH: And neither did the Nike, son…not alone. Over half a dozen D-6 cruisers came out of warp to ambush the Tecumseh. Had the Nike gone in before our other ships arrived in the system, it would have been a blood bath…and it would have cost us one of Starfleet’s most advanced warships. RON: We still lost an entire ship and crew! GARTH: But not two, Mr. Tracey! Not even an Ares-class could have held off that many Klingons! This war isn’t fair, Lieutenant. It isn’t just, and it certainly isn’t clean. It is, quite literally, the ugliest and most daunting test we have ever faced as a planet. And every choice we make, every command we give, will cost us something…because the enemy we are facing is ruthless. RON: My sister wasn’t even a soldier, sir. She worked in their sickbay. GARTH: Look, I know most of us didn’t sign up to be warriors. That’s not what Starfleet’s about. But we have to prove that we can do what we need to do to defend the Federation…no matter the cost. GARTH: That order…and the destruction of the Tecumseh…will haunt me for the rest of my life, Mr. Tracey. I see those faces and hundreds like them every night when I wake up from my nightmares. One day when you’re a captain—and I hope you will be—I pray you never have to make the decision of who gets to live and who has to die. I hope that, by the time you have a ship of your own, that there is peace in the Federation and we can all return to simply being explorers. DARIA: I think we all want that, Captain. GARTH: But in the meantime, understand this: we are all—ALL—fighting for each other. Humans, Andorians, Vulcans, Tellarites…we are a FEDERATION of Planets. We must have each other’s backs. We fight the Klingons—we DON’T fight each other. And remember this, as well: none of us, no race, no individual, is perfect. No one has a monopoly on bravery or intelligence or common sense, and no one is morally superior. We’ll all make bad decisions…or sometimes even good decisions with bad outcomes that can’t be avoided. But we must be willing to look past the bad and see the good in all the races of the Federation. Someday this blasted war will be over. It HAS to end, and we HAVE to win. There is no alternative for us. And when that finally happens, we’ll be left with what we’ve been fighting for this entire time: the United Federation of Planets. Don’t tear apart the very thing that we have been risking and sacrificing our lives to preserve. Do you understand, Lieutenant? RON: Yes, sir, I do. GARTH: I think it’s time you head back to your quarters…all of you. That’s an order. Sleep this off. There’s a still a war on, and we need you all to be at your best. Dismissed. RON: To our losses: Vulcan, Human, Andorian, Tellarite…all of the races in the Federation. We fight together. SONYA: That was quite the speech, Kel. You trying for Ramirez’s job? GARTH: No way. He can keep it! SONYA: Well, your words do lead to actions. I admire that. I think you really reached that young officer. GARTH: I hope so, Sonya. But I meant what I said: this war HAS to end, and we HAVE to win. GARTH: That’s why I asked you here. I’ve got an idea…and it’s a pretty crazy one. But I actually think it could work. GARTH: Sit down, Sonya, and order a drink. I have a feeling you’re gonna need it. From November 17, 1978. For the masochists among our readers, the entire Holiday Special is available on You Tube. It is amazing that this did not succeed in killing the Star Wars franchise. Time to refresh my chief geek of the blog credentials. To observe the 50th anniversary of Star Trek, my favorite scene from all of Trek: Commander Michael Eddington’s rejection of the Federation in the Deep Space Nine episode “For the Cause”. It is remarkable that an entertainment phenomenon arising from something as ephemeral as a short-lived television show is still with us half a century later. Partially this is due to the endless running of the original Trek series in syndication in the seventies that greatly expanded Star Trek from a small cult to a large enough audience to flourish. If viewed with a cold eye Star Trek is a fairly routine space opera with often bad writing, cheap production values, concepts that strained credulity, (an alien race modeling itself on the human Roman Empire? ), bad acting, (William Shatner take a bow), worse science and a ridiculous philosophy that seems to be an amalgam of socialism, militarism and sixties goofiness.